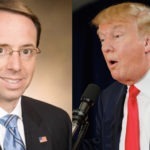 About a month ago, the media reported that Deputy Attorney General Rod Rosenstein would be resigning shortly after new Attorney General William Barr was confirmed. Rosenstein then let it be known to NBC News through his associates that he would remain on the job until whenever Special Counsel Robert Mueller was finished. But the media largely ignored this, and kept reporting that he would be leaving any day. Now the DOJ is confirming to NBC that he’s staying longer. So what’s really going on? Rod Rosenstein originally said that he planned to stay at the DOJ until Mueller’s work was done, and based on everything we know about Rosenstein, there is every reason to believe this is how he would handle things. The narrative about Rosenstein prematurely resigning has never rung true, and we’ve long suspected that it’s come from the same “sources” that keep saying Mueller is going to “wind down” his investigation at any moment. The media can’t help but run with these kinds of narratives, because when audiences start hearing reports about Mueller and Rosenstein being on their way out, it frankly scares them, and causes them to stay tuned in. It’s the same reason we hear so much media talk about pardons, when thanks to inevitable state charges, pardons were never going to play a major role in the Trump-Russia scandal. That said, there does appear to be one interesting tidbit to be gleaned from this about Rosenstein and Mueller. Based on the leaks that keep surfacing about Rod Rosenstein supposedly leaving any day now, it’s fairly clear that there is a concerted effort by Team Trump to nudge him toward the door. Donald Trump’s periodic negative tweets about Rosenstein underscore this. But now the DOJ is acknowledging to the media that Rosenstein is sticking around “a little longer.” That’s probably all the time Rosenstein can buy himself – and it suggests that Mueller will carry out his big endgame moves before much longer.